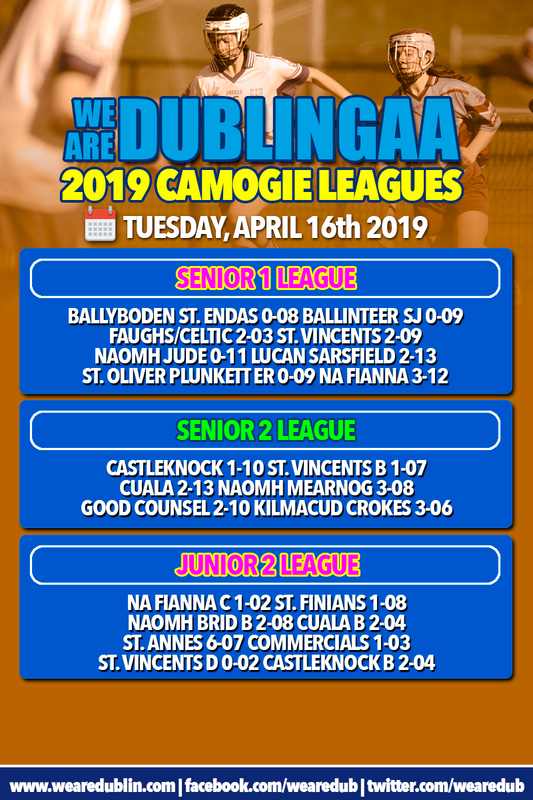 All 17 games tonight in the We Are Dublin GAA Senior Camogie League are completed and the results are in. It’s quite frightening that we’re almost half way through the Senior 1 Division. And the table is definitely taking shape. But there’s still weeks to go before all these competitions are completed. So here’s the details from all of tonight’s games. 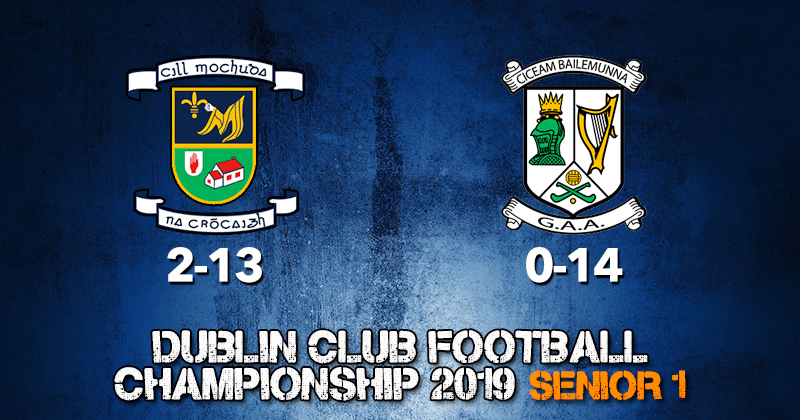 Ballyboden’s unbeaten streak came to an end tonight as Ballinteer St. John’s pipped them to a victory by a solitary score. The 0-09 to 0-08 win sees St. John’s go two wins on the bounce following last week’s win over Skerries. Faughs/Celtic were always going to find it a tough game against League leaders St. Vincents, and Vincents continue their streak now four games with their 2-09 to 2-03 win tonight. Lucan Sarsfields are up and running, registering their first win in the competition with a 2-13 to 0-11 victory over Naomh Jude. And Na Fianna come off their bye week to notch another win, with a 3-12 to 0-09 score over St. Oliver Plunkett Eoghan Ruadh. Na Fianna are only a win behind St. Vincents in the table, having used their bye. So things could get interesting very quickly with Vincents on their bye next week. 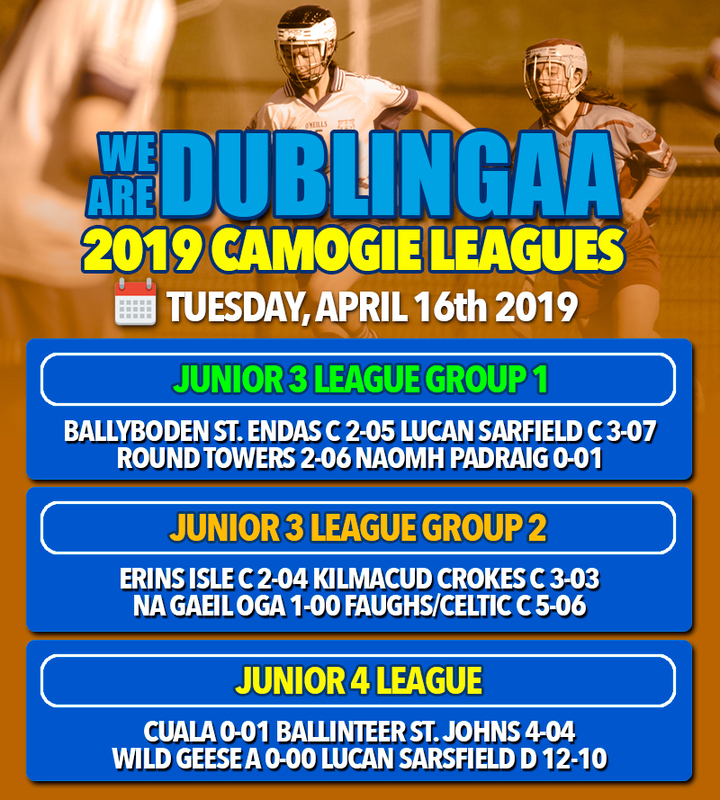 Faughs will entertain Lucan, Judes will go head to head against Ballyboden, Skerries welcome Na Fianna, and Plunketts and Ballinteer battle it out. Castleknock recorded their second win of the competition tonight, hading St. Vincents their third straight defeat. The game finished 1-10 to 1-07 with Castleknock heading to Good Counsel next week. Counsel are now three for three, beating Kilmacud Crokes by the minimum to keep them top of the table with Cuala. Cuala handed Naomh Mearnog their third defeat tonight on a 2-13 to 3-08 scoreline. Naomh Mearnog face St. Vincents next week. Kilmacud go head to head with Raheny. And as mentioned already it’s Good Counsel against Castleknock. St. Finians recovered from the massive loss to Naomh Brid last week with a 1-07 to 1-02 win over Na Fianna C. Naomh Brid picked up their second win on the bounce, beating Cuala B by 2-08 to 2-04. St. Annes got their first win of the league with a 6-07 to 1-03 win over Commercials, who have yet to get a result. And Castleknock B remain at the top with Brids after their 2-04 to 0-02 win over St. Vincents. Next week Castleknock will play Cuala, Commercials will face Na Fianna, Naomh Brid go to St. Annes and St. Vincents will meet St. Finians. Lucan Sarsfield’s D panel are two for two after whitewashing Wild Geese tonight by 12-10 to no score. They’ll welcome Na Fianna D next week in Round 3. Na Fianna were on their bye tonight. Ballinteer St. John’s were convincing 4-04 to 0-01 victors over Cuala, registering their first win after their bye in the opening round. The Dalkey girls will be on a bye next week with Ballinteer taking on Wild Geese. And that’s all the results from tonight’s games. Join us Thursday for fixtures in the Inter 1, Inter 2 and Junior 1 divisions.